After conducting our FanDuel Review, we rate FanDuel.com an obvious 5-star site. FanDuel was a pioneer in the Daily Fantasy Sports industry since it came on the scene in 2009. Since then, they have become the biggest daily fantasy sports company through investments by various Venture Capital funds and most recently Comcast Ventures. FanDuel.com currently pays out over $4 Million per week and growing. 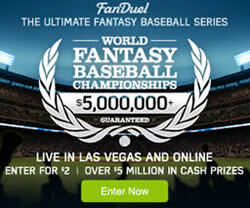 FanDuel’s fantasy baseball and fantasy football big money tournaments create millionaires each year, and can be won by anyone who plays at FanDuel by entering a free or very affordable satellite contest and winning qualifying tickets. Players who join FanDuel are well taken care of by their customer support system, and can feel safe that their funds are backed by some of the wealthiest companies in the world. 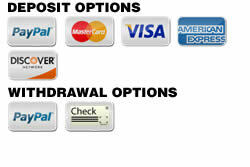 Depositing and withdrawaing your money is quick and simple. If you are going to play at a daily fantasy sports site, FanDuel is a must to have in your stable of top fantasy sites to play at. Remember that by joining through Real Money Fantasy Leagues you will receive 5 FREE Contest Entries for real cash contests. FanDuel offers Salary Cap style fantasy sports games that can be played Head to Head, against 5 or 10 people or vs. large fields of 50, 100 or more. You can create your own fantasy league and make it public, or keep it private amongst just you and your friends. 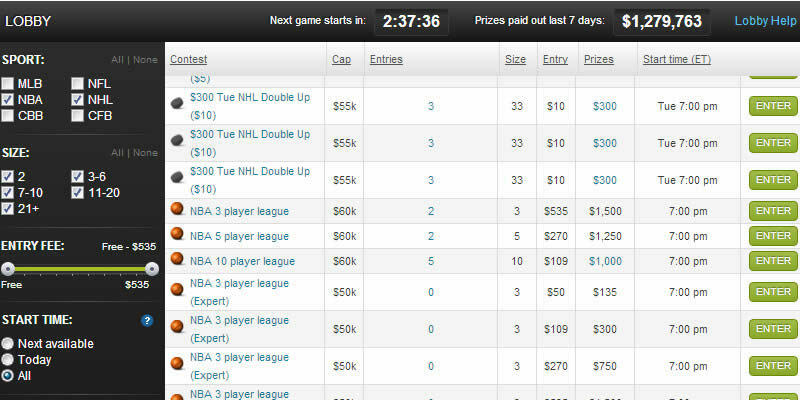 FanDuel.com also has huge money satellite contests for players that can’t afford big entry fees, but have the talent to play with the big boys. Enter satellites for free or for as little as $1 and if you win, you will get a seat at one of the big cash tournaments or win a nice chunk of change. For high rollers, there are ample large entry-fee head to head, small field or GPPs (Guaranteed Prize Pools) where up to $1,000,000 can be won! 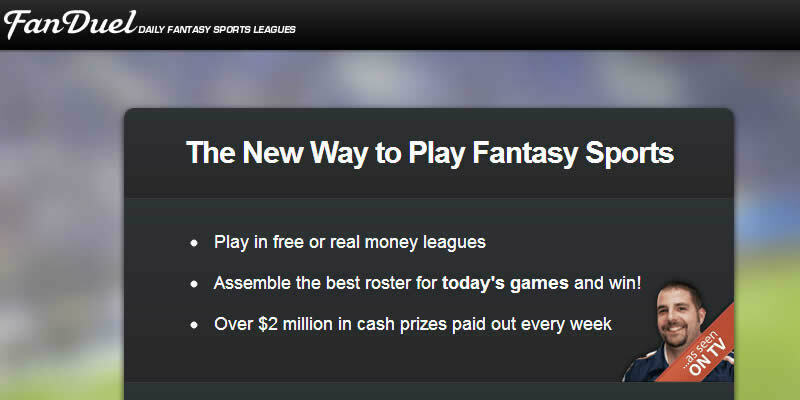 Upon signing up to FanDuel, you are entered into FanDuel’s main page. At the top right hand side you will find your username which when clicked shows all the games you have won broken down by sport. If you haven’t made a deposit yet, the Add Funds button lets you do that...and when you do, you will receive 5 FREE real cash contest entries courtesy of Real Money Fantasy Leagues and FanDuel! Under the main site’s tabs you see: How it works, Rules & Scoring, Promos, Leaderboard and Support as well as the featured contests being run at FanDuel. 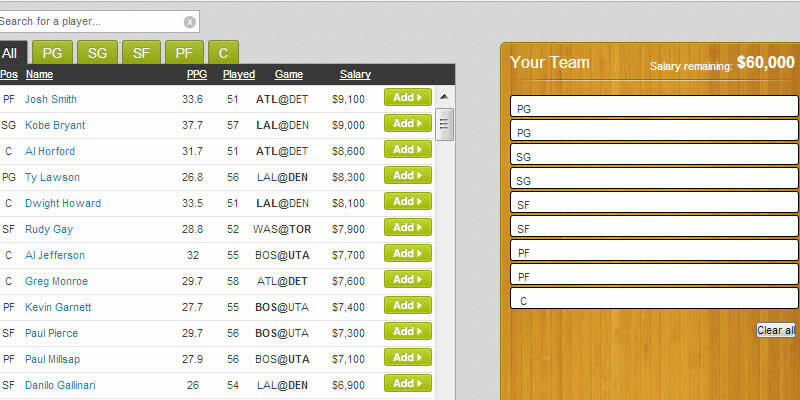 Given how many Fantasy Tournaments run for every sport, you will usually see the box full. One of the great promos they run is the "Weekly Depositors Freeroll" which you are entered into when you join FanDuel through RealMoneyFantasyLeagues and make your first deposit. Below the featured games is the Main Game Lobby and on the left is the bar that allows you to narrow games down by sport, entry fee and type of contest. To the right is the list of all the games available and you can reorganize the list by clicking the heading of each column. When working on this FanDuel review, we realized that the main reason the site has been so popular with new players to the daily fantasy sports industry is the simplicity of the site. Players don’t feel overwhelmed by too many flashing ads and hard to read information. Games are easy to find and simple to join. After you have signed up to FanDuel you will receive 5 FREE entries just for making a deposit ...and you can make that deposit using PayPal or major credit cards Amex, MC, Visa and Discover. Deposits are instantaneous and you can begin playing immediately afterwards. When you win enough money and you want to cash in some of your winnings, you can get paid by PayPal or check with a minimum withdrawal of just $1 and payouts are processed within 24 hours. Best of all, if you cash out with PayPal, FanDuel will cover your all the fees so that you aren’t losing any money on the deal. Haven’t tried Fan Duel yet?...check them out and if you play a game and win or lose but aren’t satisfied with your experience, FanDuel will return your deposit AND the money you lost. That kind of customer service has helped keep FanDuel.com at the top of the fantasy sports landscape. Last year, during Week 1 of the NFL Fantasy Football season, there was a small glitch with the live scoring feature (had no effect on the games though), and as a great customer service gesture, FanDuel created 5 fantasy football freerolls awarding over $10,000 in prizes just to say “Sorry for the inconvenience..." - that’s customer service! FanDuel’s customer service staff can be reached via Email, Phone, Live Chat or by opening a Support Ticket. 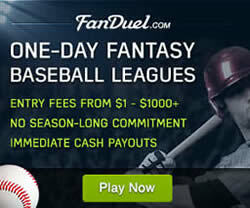 FanDuel’s mobile fantasy games are one of the best in the daily fantasy sports industry. Supported on all types of devices: Android, iPhone, iPad, iPad Air - players can play all their fantasy games on FanDuel while on the go. If you use your smartphone, the mobile site appears automatically, but if you are on a tablet, the full site is the default but you can switch to their mobile site if you choose to do so. FanDuel’s mobile platform allows you to set lineups, monitor games, make deposits and gives you the full FanDuel.com experience on your smartphone. Creating a FanDuel review on the user experience is fairly easy since they’ve been around for so long and we’ve had multiple contests that we have entered there. Once you log in, it is easy to navigate to what type of game you want to play and join the game. When you are ready to build your team, the salary cap prices are very reasonable and creating a star-studded lineup is not too difficult. You will need to do your research to pick the right players, but you won’t feel like you are scraping the bottom of the fantasy barrel to complete a team. When setting a lineup, you can click on the player name to get more stats such as his recent game log, injury status and player news. Once the games begin, their live scoring updates almost instantaneously to get you up-to-the-minute fantasy scores to see how your team is doing. If you are in multiple games at one time, FanDuel’s “My Contests” tab helps you navigate through all your games quickly and efficiently.